For the second week in a row, the deadly May 31 clash between Israeli soldiers and a ship headed for the Gaza Strip was the leading subject for bloggers. But the conversation changed markedly. Two weeks ago, critics of Israel dominated the blogosphere. Last week, supporters of its military actions weighed in with their response. From June 7-11, 15% of the news links on blogs were about the Middle East clash, according to the New Media Index from the Pew Research Center’s Project for Excellence in Journalism. While still the No. 1 story, attention dropped significantly from the previous week (32%) as a number of subjects vied for bloggers’ attention. The blogosphere conversation often involves cultural or political topics that stir intense passions and that is certainly the case with the seemingly intractable Mideast conflict between the Palestinians and Israelis. Most bloggers who discussed the subject last week agreed with a June 4 opinion piece by Washington Post columnist Charles Krauthammer who defended Israel’s blockade of Gaza and its response to the Turkish ship. Many also criticized President Obama, claiming he has not stood with Israel against its enemies. The Middle East conflict narrowly beat out the second-largest topic last week, the 2010 mid-term elections, which finished at 14%. Most of that focus was on a June 8 Washington Post-ABC News poll-released the morning of a number of crucial primaries-that found a record level of anti-incumbent sentiment among voters. Conservatives took the poll to be an ominous sign for Democrats, although some bloggers pointed out that no group of politicians was well-liked. The third largest story on blogs, at 11%, was a USA Today story about Hispanics who are fleeing Arizona in anticipation of the state’s new immigration law taking effect. 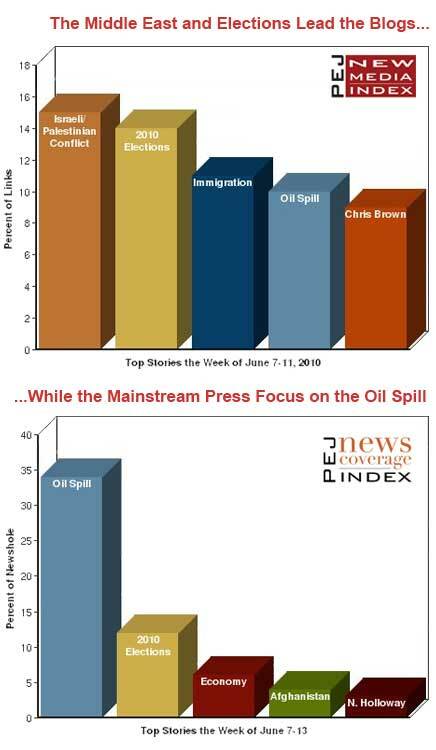 That was followed, at 10%, by news that BP had placed a containment cap on the broken wellhead in the Gulf that was now capturing 10,000 barrels of oil a day, and by a report that singer Chris Brown was denied a visa into the UK since he had been found guilty of assaulting his ex-girlfriend, pop star Rihanna (9%). On Twitter, a quarter (25%) of the week’s Tweets were focused on news about Apple. 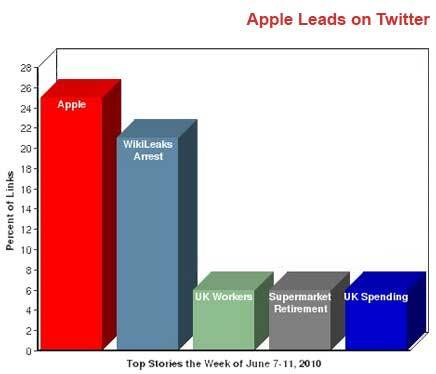 Apple is a common focus of tweets as this marks the ninth time in 2010 when the company and its products have been the leading subject. Last week, there were many stories about Apple that drew attention including a comparison of Apple’s new iPhone 4 with another similar device, the HTC Evo, and a report by Wired that the company’s web browser, Safari, has an ad-blocking feature that "nudges" online publishers to its own app store. A close second on Twitter, at 21%, was another Wired article about federal officials who arrested a 22-year-old Army intelligence analyst named Bradley Manning who reportedly boasted of giving classified information to the whistleblower website, WikiLeaks. The next three biggest stories on Twitter were all focused on British subjects, and each made up 6% of the week’s links. No. 3 was a survey showing that one in four people in the UK work the entire day without taking a break. The retirement of Sir Terry Leahy as head of UK’s biggest supermarket chain was fourth. And news that George Osborne, the Chancellor of the Exchequer of the United Kingdom, pledged to consult the public about the government’s spending choices was fifth. In Charles Krauthammer’s June 4 Washington Post column, he vigorously supported Israel’s blockade of Gaza and claimed the international community was de-legitimizing Israel’s right to defend itself. Most bloggers who linked to the piece agreed with his arguments and a number re-published excerpts of his text. "Charles will be dismissed because he’s Jewish, but Israel today seems to be the only civilized population that does not have a right to defend itself," added Rick Moore at Holy Coast. Some criticized President Obama for not backing Israel strongly enough. "Team Obama is sucking up to the growing gaggle of Islamist activists (who include Turkey’s virulently anti-Semitic leader) while Israel is increasingly isolated-partly due to ritualistic, absurd condemnations of Israel by Euro-jackals," argued John C. Wohlstetter at Letter from the Capitol. "It’s become increasingly apparent…that these anti-Semitic and anti-Israel tendencies on the Left are becoming much more mainstream," complained Bethany Shondark at Right Side of the Wrong. "Obama’s anti-Israel stance cannot be refuted by any realistic watcher of American politics." A smaller set of bloggers took exception to Krauthammer’s arguments. "It’s not too surprising the angry neocon Zionist Charles Krauthammer is goes on the defensive by playing the victim card," decried Ron Beasley at Newshoggers. "The reality is Israel has been committing national suicide for over 40 years and now finds itself isolated." "To read Charles Krauthammer today is to enter a twilight zone of an alternate reality," criticized well-known blogger Andrew Sullivan at the Atlantic. "A country permanently occupying and colonizing a neighboring region, and treating its original inhabitants as dangerous interlopers, is the victim." The June 8 Washington Post-ABC News poll released on the biggest primary day of 2010 found anti-incumbent sentiment at an all-time high. Conservative bloggers took the poll to indicate real trouble for Democrats. "The poll warns Democrats more about the dangers of an anti-incumbent tide," surmised Ed Morrissey at Hot Air. "Only 29% want to re-elect their incumbent Representative, down from 37% in February. That’s a new low; even in 1994, that was 37% in the WaPo/ABC poll. Given that there are a lot more Democrat incumbents, the indication is for a big turnover." "There is some evidence that Republicans are in better shape than Democrats," concluded Merv at Prairie Pundit. "The Democrats are dodging voters at Town Hall meeting while Republicans are doing outreach to get ideas on what the voters want. Polls also show greater intensity among Republican voters and in the Tea Party movement. That suggest a stronger turnout." Others, albeit a small minority, pointed out that while Democrats were unpopular, the Republican Party did not fare well in the poll either. "This is going to be one of those times where None Of The Above would be the winner if it could get on the ballot," said Minstrel Boy. The most viewed news video on YouTube last week reflects something we have seen in the social media-the gawker impulse in which an accident, often an unusual or visually compelling one, proves to be irresistible. The top video was a 12-second clip of a driver running her car into a divider at the toll plaza at Dallas-Fort Worth International Airport. The car then launched into the air and goes off screen. The driver, a 22-year-old named Yasmine Villasana, was reportedly drunk at the time and suffered only minor injuries. The dramatic footage was viewed 3.6 million times last week, easily outdistancing its competition. 3. A German comedy group known as Die Aussenseiter conducts a practical joke at a McDonald’s drive-thru. A prominent Web tracking site Icerocket, which monitors millions of blogs, uses the links to articles embedded on these sites as a proxy for determining what these subjects are. Using this tracking process as a base, PEJ staff compiles the lists of links weekday each day. They capture the top five linked-to stories on each list (25 stories each week), and reads, watches or listens to these posts and conducts a content analysis of their subject matter, just as it does for the mainstream press in its weekly News Coverage Index. It follows the same coding methodology as that of the NCI. This process allows us to compare the New Media commentary, based on the Icerocket list of links, with the commentary in the traditional press. Note: When the NMI was launched in January 2009, another web-tracking site Technorati was similarly monitoring blogs and social media. PEJ originally captured both Technorati’s and Icerocket’s daily aggregation. In recent months, though, this component of Technorati’s site has been down with no indication of when it might resume.